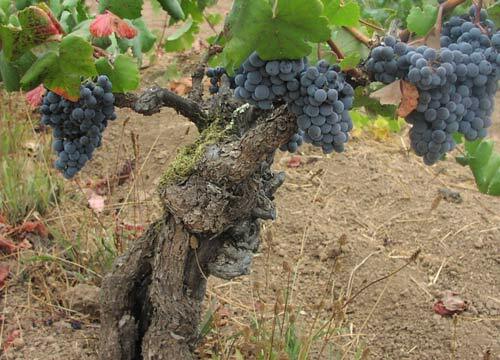 The oldest producing Zinfandel grapevines in California, may be the best Zinfandel in the United States, and it bears the Bucklin name on the label! — Raymond Sokolov, Nov. 2007 issue of the Wall Street Journal’s Smart Money. 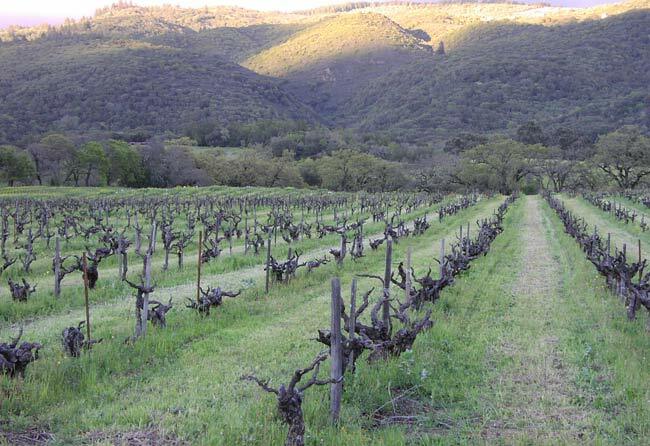 The Bucklin Old Hill Ranch vineyard is a historical vineyard founded in 1851. Vines now so ancient, and not given any artificial watering for more than a century and a half, that each ancient vine only produces a few bunches of grapes. Average yields of Old Hill rarely exceed one and a quarter tons per acre. There is great concentration of flavor in the few grapes per vine. The wine is of deep color and taste, with layers of flavor that will delight you, immense complexity, smooth and approachable on the palate, with long tastes of fruit and spices. The 160+ year old vines in the core 14 acres of this historical vineyard make this probably from the oldest vines in California. It’s not only “Old Zinfandel” but “Ancient Zinfandel”. This vineyard is owned by four Bucklin siblings (Arden, Kate, Ted and Will) and operated by winemaker Will Bucklin. The 16 (yes, 16) varieties of ancient vines in the 14 core acres of the Bucklin Old Hill vineyard causes different maturing dates in the same field. This means that winemaker Will Bucklin may have three different harvests, at different times, to gather the grapes. The resulting “field blend” Zinfandel is a wine of deep color and taste, with layers of flavor that will delight you and inspire wine connoisseurs. If you thought Zinfandel could never surpass Cabernet Sauvignon in taste and complexity, find out you are wrong by drinking Bucklin “Old Hill Zinfandel”. William McPherson Hill, the founder and namesake of the Bucklin’s family’s Old Hill Ranch, is credited as making California’s first really famous Zinfandel wine. Here is what the press said over 135 years ago! “We sampled a bottle of wine from the cellar of Wm. McPherson Hill made from the Zinfandel grape, a new variety that is growing in favor with winemakers.…The wine was pronounced by the gentlemen who tasted it to be superior to any they had seen in the state.” Pacific Rural Press (December, 1871). “[Would take a first at a National Exposition.” Alta California (20 May 1870). Charles Sullivan, a leading wine historian, specializing in California’s wine history, wrote the undoubted best history of California Zinfandel [Zinfandel: A history of a grape and its wine (University of California Press, Los Angeles and London, 2003)]. He authenticated the ancient history of the vines from which the fabulous Bucklin Old Hill Zinfandel is produced, and said this about the vines from which Will Bucklin produces his Zinfandel. We don’t have any financial interest in the winery, so we are entitled to express our opinions in unqualified terms. We are in good company. Prominent experts are also enthusiastic about this wine. But you will never find it in your local wine store. Will Bucklin just doesn’t produce much from the 14 acres of these 150 year old vines, so it’s sold only directly by him from the winery. The portion of the grapes sold to Joel Peterson for his Ravenswood winery, made into Ravenswood’s Old Hill Ranch Zinfandel is sold out to a few favored customers even before it is released! Will Bucklin studied wine making at the renowned wine making course at Davis. Upon his graduation he was interviewed by the Rothschilds and awarded an internship at Chateau Lafitte Rothschild in France. (If you are at the Bucklin winery, ask Will what the employees drank at Chateau Lafitte Rothschild, and what was the inspiration for Bucklin’s Mixed Black – a unique taste in American wines.) From the Château and his education there, Will worked for several years in the wine business in France, then Australia. In 1992 he went to Eugene, Oregon, as winemaker for the King Estate Winery. 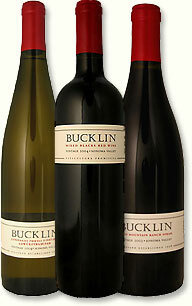 In 2000 he moved back to California to manage the ancient vineyard and start the Bucklin family winery. Bucklin and Ravenswood are the sole producers of wine off the vineyard. Ravenswood, the wine producer known inside California for their handling of Zinfandel grapes and the many Zinfandel field designates they sell (and known outside California for their 400,000 case production size of Zinfandel wines) in past years have been able to buy a rationed amount of grapes from the Bucklin vineyard. Ravenswood uses it for their top tier vineyard designate Old Hill Ranch Zinfandel. Here’s one of the many reviews of that great wine. “Of all [Ravenswood’s ]… Zinfandels, the wine that gets the highest praise is Old Hill Ranch … a monster in aroma – blackberry and black pepper scents… A fascinating wine.” Los Angeles Times, September 19, 1991. When I was at Ravenswood, they told me they charged $60 a bottle for Ravenswood Old Hill Zinfandel (same grapes as Bucklin Old Hill Zinfandel) and sell out their 600 cases to their wine club before the wine is ever released to the public. So buy some of Will Bucklin’s wine production of 600 cases at about $30 a bottle when you have the chance.